08-Aug-2011 -- This is the 5th out of 6 confluences that we reached on a 3-week trip through Honshū and Hokkaidō. The story starts at 36°N 140°E. The previous report is 43°N 143°E. In the early afternoon we reached the coastal town Shiranuka (白糠町). From there, the beeline distance is only 8 km, but without maps, this hunt turned out to become a trial and error approach. After cruising along all roads in the area, we finally found ourselves within 770 m beeline distance to the confluence. We parked at the roadside of the meadow that had been described by Greg Michaels and started our hike. After crossing the meadow, a fence, and a deep canyon with a river at its bottom, we found ourselves in a swamp with high grass. Progress was slow and very wet – too wet to have pleasure on this hike. So we left the valley and shortcut over a mountain. After leaving the wetlands it was dry, but therefore the high bamboo grass (Sasa senanensis) handicapped us. Wading through the bamboo was strenuous and an additional strain came from the fact that we had to cross over a high mountain. In order to reach the exact location of the confluence, we had to drop down into another steep valley. Right at the valley bottom we located the confluence, which was overgrown with high grass and flowers. 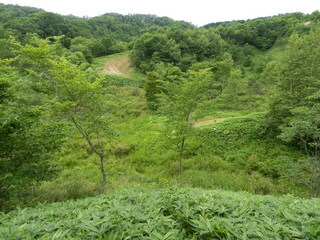 It is actually the only spot in the area that is not covered with bamboo grass. Gadflies attacked us as we begun documenting the confluence point, so we quickly left the area again by hiking up the bamboo mountain again. We followed the same way back – so we could make use of our previously “beaten track”. Time starting the hike: 2:35 p.m.
Time at the CP: 3:35 p.m.
Vegetation: high grass, flowers, farns, swamp, bamboo grass (Sasa senanensis) and beech trees. We continued further east where the story ends at 43°N 145°E.